“From London to London,” reads the caption of my Instagram post as I departed London, Ontario for a very exciting weeklong trip to London, England! 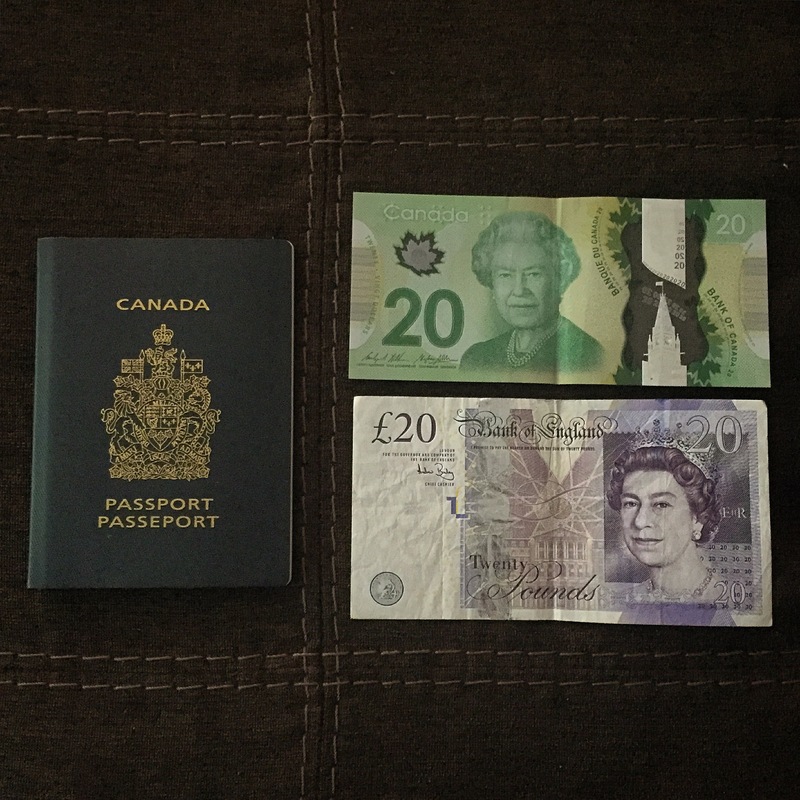 The photo (below) features British and Canadian currency, and the magic ticket that would allow me to cross overseas: my passport. 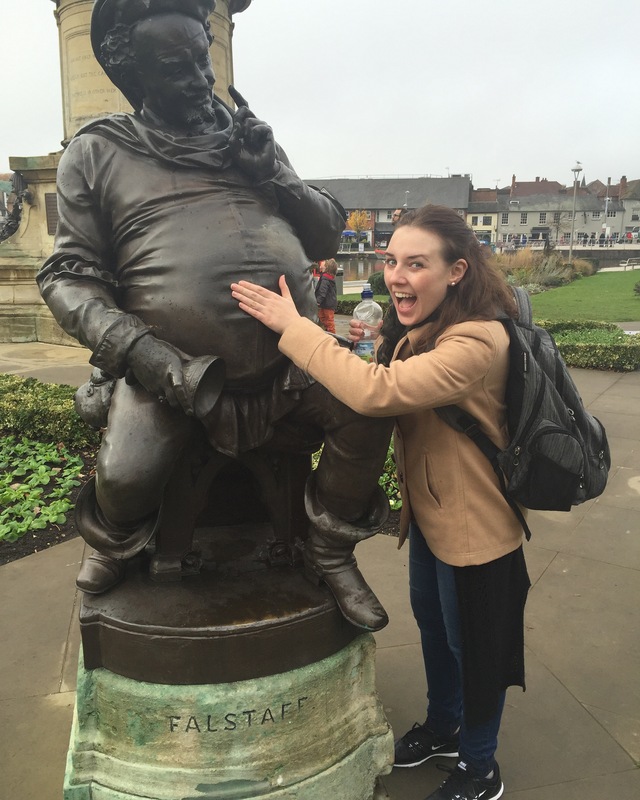 This trip to England marked my first time to Europe and I couldn’t have been more excited! Just carrying the foreign currency in my wallet made me feel worldly, sophisticated, and gave me a real hankering for tea and crumpets. The trip’s purpose was to help design and plan the future Destination Theatre course (for more details, see Kim’s earlier post here), and to build relationships with academic institutions in England with which Western students will eventually have the chance to be involved. I accompanied my professors, Kim Solga and M.J. Kidnie, on this journey across the pond and gratefully became an intern of sorts. I participated in meetings, took notes, and offered feedback from a student’s perspective, trying to answer the question, what will future Destination Theatre students REALLY want in a trip such as this? Well, if future trips are anything like this one, those students are in for a treat! I was lucky enough to see 5 plays in 5 days. This was nothing short of heavenly. The first play I saw, Teddy Ferrara at the Donmar Warehouse, I caught on our first night, still jet-jagged, with a friend I had met only a few months prior during a summer acting program in NYC. All hail the connective powers of travel! The other shows, ranging from a West End musical, The Book of Mormon at the Prince of Wales Theatre, to a nearly 4 hour Greek Epic, Oresteia at the Almeida Theatre (Trafalgar Studios), each offered something unique. However, all productions are not created equal and the scales were tipped heavily in the favour of the West End musical scene when I saw The Book of Mormon. The Book of Mormon was, without a doubt, the most fantastic thing I have ever witnessed. I smiled from start to finish. Actually, I was smiling long before the show even began because of the good fortune that had brought me to the front row of the greatest musical ever created (my apologies to all other pieces of theatre EVER). This good fortune began when, during some souvenir shopping near the end of our trip, fate had me stroll down a street called Coventry. While walking to find lunch, I happened upon the Prince of Wales Theatre where two representatives invited me to enter the ticket lottery for the matinee performance. Spoiler alert: I won the ticket lottery and was able to purchase a £100 front row seat for a mere £20! Caity in musical theatre heaven. The lottery process itself was quite the event. A real ceremony, full of pomp and flair. The theatre representative draws a ballot from the large, spinning drum and teases the crowd by saying something to the effect of, “One ticket… Going to… America…” – and then pauses for all the hopeful Americans in attendance to squeal with excitement before announcing the lucky winner’s name. Once my name was called (yay!) I claimed my ticket and began to feel like a real V.I.P. : I was barraged with congratulations from theatre staff and fellow ticket winners. Such fun! 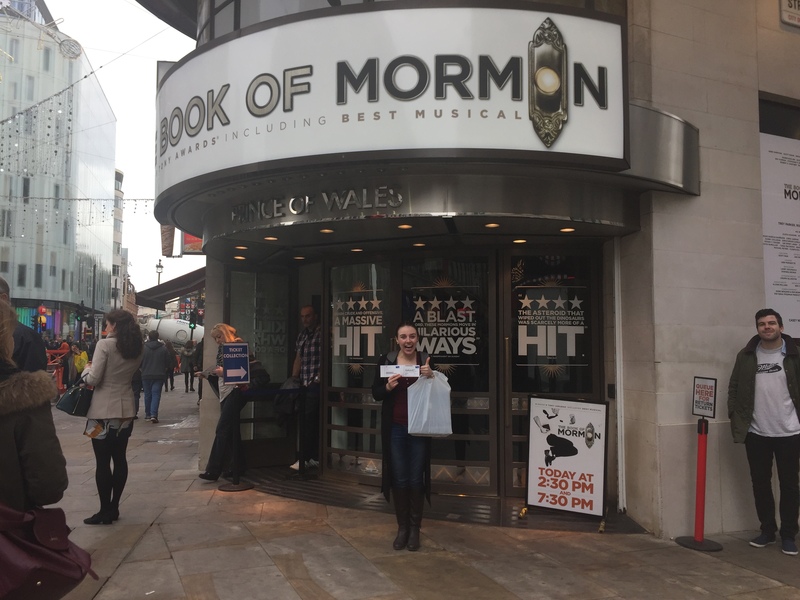 So, if you should ever find the chance to attend a production of The Book of Mormon, do it! I’ll even cross my fingers that you’ll win the ticket lottery, too. Besides the many examples of incredible theatre I was lucky enough to see, I had a blast exploring London as well. Kim and M.J., both with years of London living under their belt, were superb guides as I got to know the city. They offered insider knowledge only privy to someone who has held a London address (did you know you can order in the express line at Monmouth Coffee if you buy coffee beans at the same time? Also, the falafels at Gaby’s Deli on Charing Cross Road are unrivalled), as well as supportive encouragement so I could feel confident exploring the city for myself. I’ll proudly tell anyone that I learned at least a few of the major Underground train lines while away and returned to Ontario envious of London’s superior public transit system. 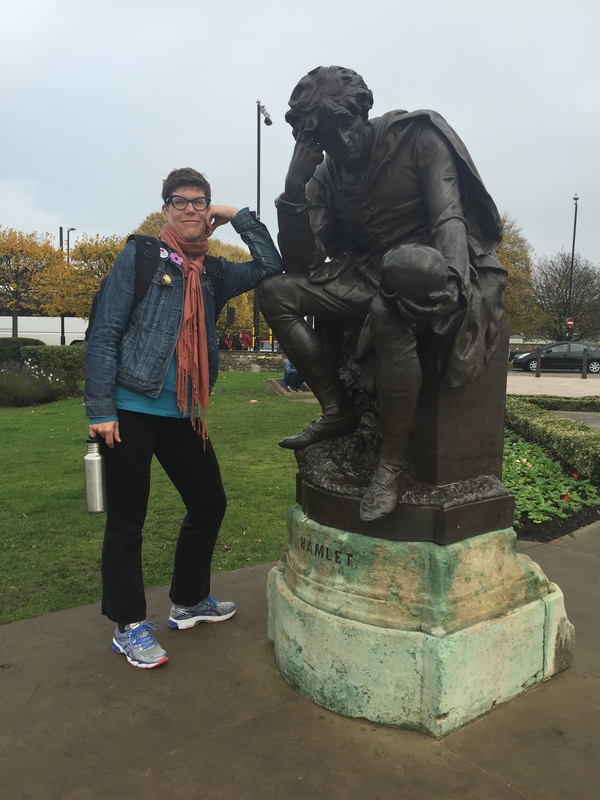 …while Kim ponders her next move with Prince Hamlet. 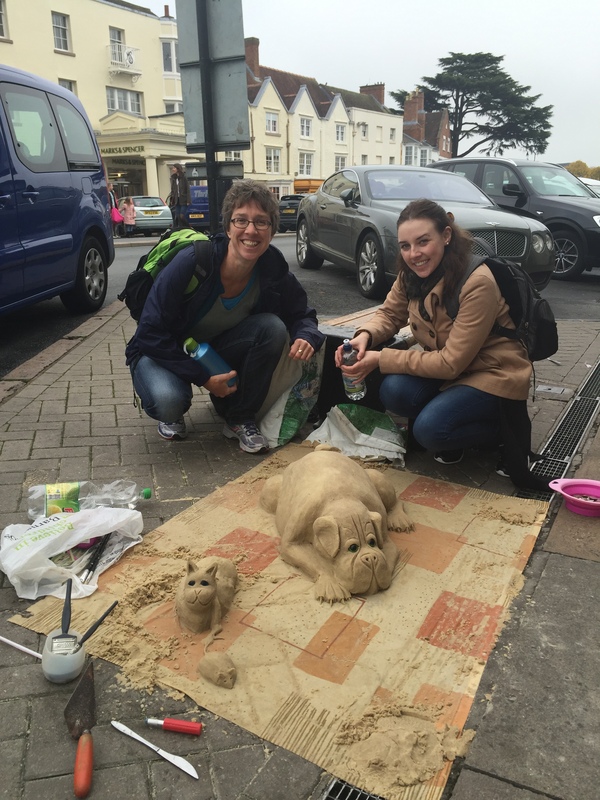 Oh, and that dog is made out of sand! MJ + Caity are impressed. But we also participated in several really productive meetings with different Stratford institutions and returned to Queen Mary with lots of exciting Stratford opportunities for future students. Amidst all the excitement of a first time trip to England, one of the features that struck me most was the genuine kindness of almost everyone I met. Locals, and perhaps fellow tourists, helped me when I asked for directions and cashiers patiently waited while I tried to make sense of the British currency in my wallet. Along with the nameless strangers I encountered, I met several of Kim’s and M.J.’s many friends and colleagues in London, all of whom made me feel very welcome. It was really lovely to see how incredibly well-respected and well-liked my professors are, though for anyone who has known them, it doesn’t come as a surprise. Kim and M.J. have got to be two of the hardest working, most determined, creative people I know. I’m convinced their days have more than 24 hours because the amount they accomplish from sunrise to sundown is hard to believe. I marvel at their work ethic and was honoured to be welcomed so warmly into their process. As an English and Theatre Studies student graduating this year, I will remain incredibly grateful that I was able to experience Destination Theatre in its first iteration and am so excited for the future of the program. To any and all potential students reading this: renew your passport, pack your bags, and get ready for the experience of a lifetime!